A range of colourful kitchen tools made with stainless steel and soft touch plastic handles. 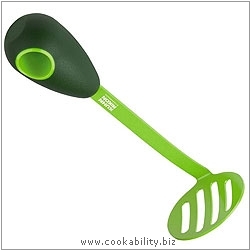 Mash up and prepare avocados to guacamole just the way you like it with our Avocado Masher. Getting just the right consistency with it is child’s play. Smooth with a few chunks is how we like it! Try it on sweet potatoes, potatoes, chickpeas and hard-boiled eggs too.